Anyone promoting ClickBank products on e-marketing niche would have most probably heard the name Patric Chan who is famous with his top selling ClickBank product, CB Passive Income. It is a Done-for-You affiliate marketing funnel system to help anyone earn affiliate commission with Clickbank on autopilot. To make money from this program, you just need to drive massive traffic to any of the 7 unique links inside CB Passive Income and build your subscriber list. Patric and his team will do the rest to monetize from your subscriber list and when someone buy any of the offer, the 100% commissions is yours. More information can be found in this CB Passive Income Review. Recently I have purchased CB Super Affiliate Training, a coaching program by Patric that claims to help anyone become super affiliate and earn up to 6 and 7 figure affiliate commissions. This coaching program is also one of the 7 unique links/product promoted by CB Passive Income. To let you know upfront, I am a customer and also an affiliate actively promoting CB Passive Income. The reason I am writing this post is not to share about CB Passive Income but to share with you how the coaching program CB Super Affiliate Training works and why you should start your online business with this awesome program. What is CB Super Affiliate Training? 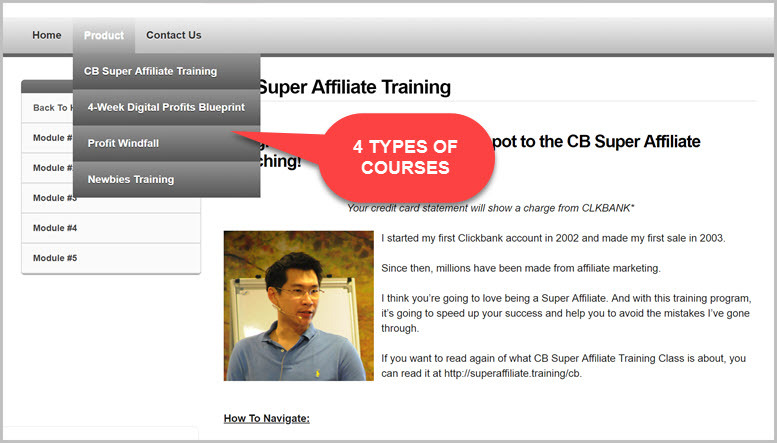 What I Like About CB Super Affiliate Training? What I Don't Like About CB Super Affiliate Training? How Much is CB Super Affiliate Training? Why Did I Purchase CB Super Affiliate Training? Can CB Super Affiliate Training Help You Become Super Affiliate? Summary: This super affiliate coaching program teaches you how to build your brand, build customer list and mastering free traffic. It's a content-packed coaching program promoted via CB Passive Income. 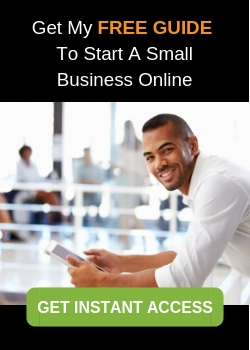 It's great for anyone who wants to build a long-term online business. 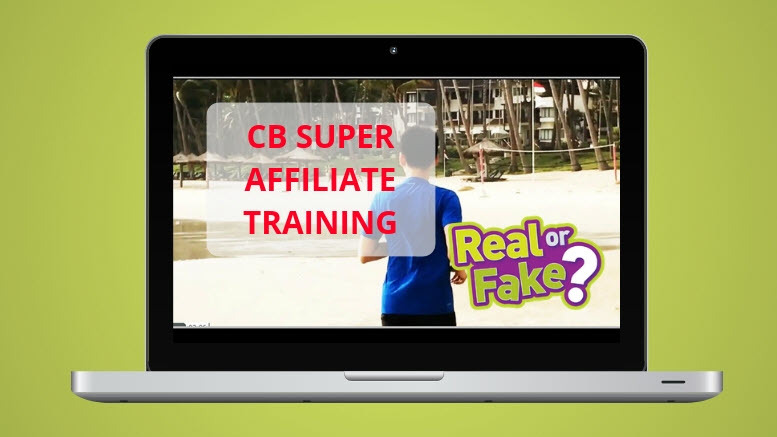 CB Super Affiliate Training as the name indicates, is a content packed coaching program created by Patric Chan aims to help anyone become a super affiliate, making $10,000 or more affiliate commissions per month. Patric in his CB Super Affiliate Training sales video urges people “don't just be an affiliate marketer but be a SUPER Affiliate from the start”. If you are not aware, super affiliate is a name given to affiliate marketer who constantly ranked top 10 on leaderboards of various product launches. After years of experience in e-marketing industry, Patric identifies 3 pillars to start affiliate business on fast track to become super affiliate. Let's get inside CB Super Affiliate Training and see whether this coaching program can really help anyone to become super affiliate. Inside CB Super Affiliate Training, there are 4 types of coaching program which I'll explain one-by-one starting with CB Super Affiliate Training. CB Super Affiliate Training: This is the main coaching program that you are buying into and is the most comprehensive ones with massive courses. There are even some courses I can't find inside Wealthy Affiliate, an awesome program that helped me start this business blog. There are 5 modules altogether in CB Super Affiliate Training to be completed in 5 weeks. Here's what you will learn from each module. This is the pillar training for the entire Super Affiliate system to give you an overview of how e-marketing business model works. Once you understand the business model, you will be able to promote even the high ticket products to earn 10x commissions. You will learn how to identify a profitable niche, select domain and choose an affiliate product to promote. In this training, you will be taught how to create your persona/identity, gain authority and how to position yourself in your selected niche. 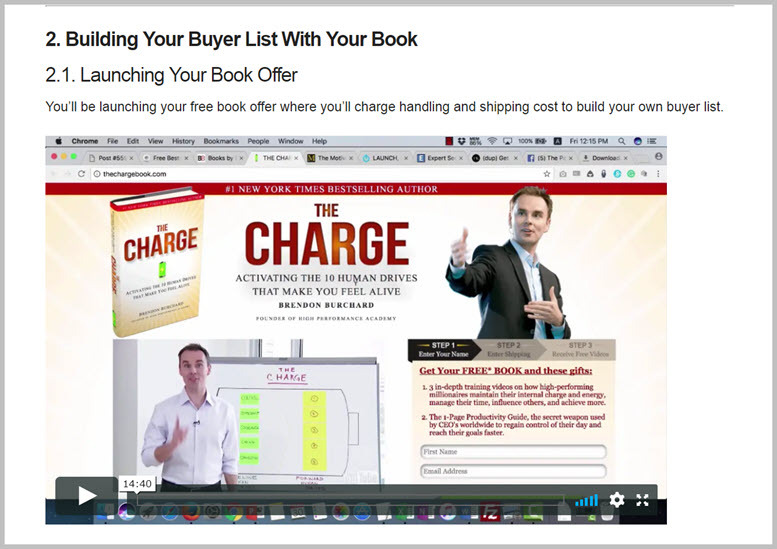 There is step-by-step guide on how to write a book and create YouTube video to boost your authority. This is probably the most powerful strategy to become a Super Affiliate and the most valuable module inside CB Super Affiliate Training. There are 2 main things you'll learn. First on how to have digital or physical products to sell without spending months or weeks creating them. 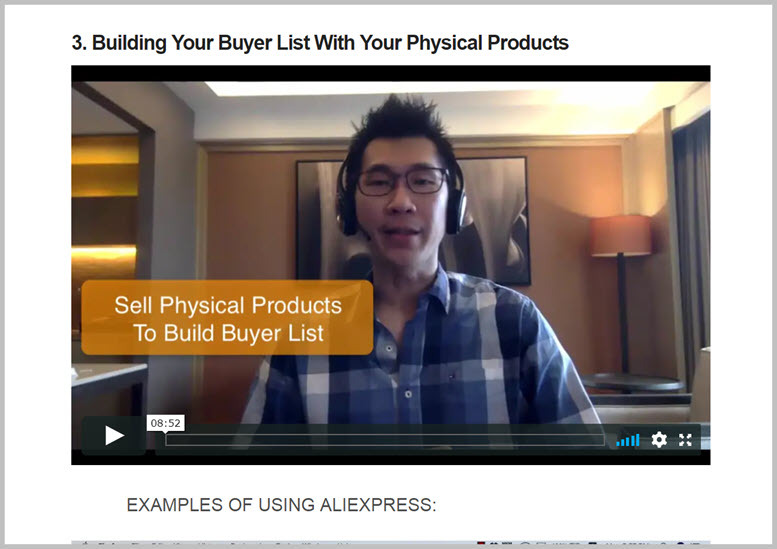 Second, how to build a customer list by getting them to buy from you. This includes step-by-step guide to create landing page, free offers and strategy to monetize your list and attract real buyers into your marketing funnel instantly. Unlike Wealthy Affiliate that focuses more on free traffic strategies, CB Super Affiliate Training make it a point that all super affiliates advertise to get traffic. Simply because it's the fastest way to promote and earn commission. You will learn how to buy email ads aka solo ads or newsletter advertising, Facebook Ads and Bing Ads. However there are still 20 minutes of super basic or maybe outdated training on free traffic. Once you master the fundamental of traffics, this module will show you proven money-making tricks, tactics and hacks to convert your subscribers to high ticket sales via each of the traffic method including FB Messenger Ads. These are the most powerful secrets that Patric has been using for many years to win affiliate prizes and generate evergreen affiliate sales. 4-Week Digital Profits Blueprint: As the name suggests, this coaching program is divided into 4 weeks with over 5 hours of video training and 45 pdf modules to teach you how to create and launch your own info-product business. This training teaches you how to research for a profitable niche, keyword and how to quickly write high demand content that keep people reading. Upon completed this course, you will have your first info-product where you can published as Kindle or use Camtasia to create video with the same content. Step-by-step guide to write persuasive sales copy with compelling story to promote your info-product. In this course, you will also get 10 headline templates to be used inside your sales copy. There are 8 pdfs altogether to teach you how to promote your info-product by getting other people to send you traffic. Inside this module, you will be given email sequence templates and 25 giveaway ideas to get leads. This training is about setting up autoresponders to rollout your email marketing campaign using 16 structurally designed checklist. Inside this training, you will also learn bout Kindle eBook publishing and marketing including everything listed below. Most of the content are in pdf format and there are some similar training available inside CB Super Affiliate Training. Profit Windfall: This is a 90 minutes video training that walk you through step-by-step guide to rebrand existing software and launch on JVZoo to make money. Newbie Training: I this Newbie Training, you will learn how to create website and setup email autoresponder. You need to buy you own domain and hosting for this purpose. However, if you want to try build a website for free, you can start one below. When you subscribe to this coaching program you will also gain access to 4 powerful software tools to accelerate your success. These tools are uniquely different to build your super affiliate business. Software Tool #1 The Marketing Page Builder: There are many great page builder tools like ClickFunnels and LeadPages that charged monthly. Personally, I used WP Profit Builder, a powerful funnel creator that only charge a one-time fee with free updates. Inside CB Super Affiliate Training, you will be given free basic page builder tool with 200 pre-made “drag & drop” template blocks to create landing pages. Software Tool #3 In-Ads Video Player: Have you seen those videos where ads can appear when video's playing? This is created with a special software and is provided inside CB Super Affiliate Training. Software Tool #4 AutomatedCart Survey: This tool helps you to create unlimited cloud-based survey, lead generation, lead capture and customer feedback. With this software, you can run campaigns to segment your list into different types of customers. In fact there are so much more templates, tips and hacks inside CB Super Affiliate Training where you can get all the information by clicking the button below, including 3 free high quality training video!. Solid Training with Real Money Making Strategies: Patric has created a very high quality coaching program loaded with tons of insider tips, hacks and strategies he applied in his business. Like Wealthy Affiliate, CB Super Affiliate Training teaches you how to build a long-term online business that can help you generate consistent income, except that the strategy taught by both program is different. Suitable for Newbies and Experienced Marketers: Despite training inside CB Super Affiliate Training is geared towards marketing strategies rather than step-by-step guide, it is still suitable for anyone. If you are a complete newbie, there's a newbie section where you are able to learn how to build a website, landing pages and setup email autoresponder with AWeber. Misleading Information: The claim by Patric that this coaching program is only available to a maximum of 30 pax per class is misleading or maybe is an outdated information. This product was launched two years ago and all training are already pre-recorded inside member dashboard. No Free Upgrade: Unlike CB Passive Income where you pay one-time fee to enjoy free lifetime upgrades, CB Super Affiliate Training doesn't come with this benefit. Strategy inside this program were introduced a few years ago and it was never updated with fresh content. 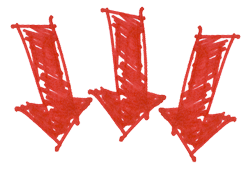 The problem is there are always new marketing tactics or tips introduced every now and then. Without constant updates with fresh content, members of CB Super Affiliate Training will not be able to get first hand information. No Opportunity to Network: Yes, CB Super Affiliate Training is great, but in any business you need to network and build relationship so you are aware of the latest updates, sales tactics or strategies used by other marketers. There is no community you can network with in this program. Imagine when you need experienced marketers to brainstorm ideas, there's no one you can turn to because from the beginning, there's no platform to build your relationship. The only way you can get support is by sending support ticket and you won't even know who you are communicating with! That's COLD right? Unlike Super Affiliate Network that can cost you up to $30k to get full access, CB Super Affiliate Training is only priced at $997 for a one-time payment. For such high quality content, you definitely get more value that what you are paying for. Even if you get a sneak preview of this training is already valuable. Click the image below to access FREE coaching. **Reminder: There are three videos in this preview training. You need type a comment below Part 1 video to gain access to the next training video. This is one question I kept asking myself. Why do I keep buying products created by Patric Chan? Other than he being a Malaysian which I am too, his product is indeed value for money …. way more valuable than what you are paying for. There's no other reason I can find better than this that makes me continuously buy his products. Seriously, if you are a complete newbie to internet marketing and want to quickly make money without going through the hassles to create website, setting up autoresponders, learning SEO or create sales funnels, I would advise you to just buy CB Passive Income and learn how to invest in paid advertisement with the free lessons inside member dashboard. That's it. It's just so simple. But of course, you must be willing to spent some money in paid advertisement so you can learn as you test every campaign. Yes, CB Super Affiliate Training can indeed help you become super affiliate. The key is to be consistent. I am sure if you consistently follow my post, you definitely know that I started my business with a program called Wealthy Affiliate, and I hold very strongly to this program. Despite it's an awesome affiliate marketing program complete with all the training and tools that has helped me make money online, however it lacks training on funnel strategy, another marketing strategy that stood the test of time. Funnel management is the expertise of Patric Chan. He's a real master in applying this strategy whereas Kyle of Wealthy Affiliate is the master of applying SEO-optimized content strategy. To become super affiliate, both strategies have to go hand-in-hand. That's also another reason why I decided to try CB Super Affiliate Training. Look at super successful marketer Neil Patel and Pat Flynn, both of them apply funnel and SEO-optimized content strategies concurrently to build their multi-million empire. If you have some budget and want quicker result, then start with the program CB Passive Income and get CB Super Affiliate Training or Wealthy Affiliate later on. But if you prefer to start everything from scratch so you can have more control over your business, then I suggest you to either start with CB Super Affiliate Training or Wealthy Affiliate. Either one, you can build a long-term real business online, provided you can consistently learn, take action and willing to invest some money to make this business works. I hope now you already have good understanding of CB Super Affiliate Training. If you find this post valuable, I hpe you can share on your Twitter and Facebook. Profit Injector Review: Latest or Outdated YouTube Cash Generator? 9 Comments on "CB Super Affiliate Training: Unique Link of CB Passive Income"
Hi Florence – I am fimiliar with ClickBank and I do promote one of their products, however, I had not heard of CB Passive Income. I am new to affiliate marketing, so I have a lot to learn yet. Thank you for providing so much information about the CB Super Affiliate Training program. Your review was very thorough and very helpful. It sounds like a great opportunity that I may have to consider. Great to know that my CB Super Affiliate Training review helps. You should try out the free training. There are really so much knowledge to learn just by watching the 3 videos. Very often, complete newbies can easily feel overwhelmed with information overload and quit, despite spending tons of money on training. Most common reason that makes anyone fail is the lack of persistence and consistent action. Many people just lack the patience to build online business. No matter how good a program is, if that person does not have the will power to succeed, nothing will happen. Thank you very much for this piece of information. The click bank super affiliate by Patric Chan according to your review is a blessing to the online world. I will start saving up so I can have access to this unique training and revenue earning opportunity. How true is the assertion that one can make $10K a month using this tool? Whether with CB Super Affiliate Training or Wealthy Affiliate, anyone can make $10k per month provided consistent learning and action is taken. Both program comes with free training. If you want quick result, then go for paid advertisement. But if you have 1 to 2 years time to build your business, then Wealthy Affiliate will be better choice to get 100% free traffic. Hi, I tried to go in the link for free CB super affiliate training but I think the link is broken or something. Can you give me that link please. I would love to take a look at it. Even though it is pricy but I think I can learn a lot from this program so I can be a better affiliate marketer. Will consider joining the program. Thank you for the review! Hi Nuttanee, thanks for pointing this out. Ya, I’ve just rectify the link issue. Here’s the link to free training of CB Super Affiliate Training. You have a very well structured website which is ultra inviting. It is fun and very informative to go through all of your website. I have gone through most of your links and every new page which comes up is colorful, inviting and very full of relevant education on online marketing. Your Call to action pop-up is very well configured and comes up regularly but does not feel aggressive….ie right size and easy to discard if not needed. Your rolling menu for resources is a fantastic idea and easy to follow. It also leads to great educational material. I conclude in saying: “Congratulations on your very welcoming website and wishing you the very best in all of your projects. Thank you for reviewing another Patric’s product – CB Super Affiliate Training which is something new to me. I do have a few questions in mind: 1. Is CB Super Affiliate Training part of the upsell product of CB Passive Income? 2. Do you think the dated training is still relevant to today’s market? I agreed with you that utilizing funnel together with SEO-optimized content strategies could scale your business to the next level in the long run. Well, l will sign up for the CB Super Affiliate Training to see how this program can fit into my business. Hi Zayn, thanks for reading my review. CB Super Affiliate Training is not an upsell inside CB Passive Income. It’s just one of the unique link members of CB Passive Income can grab to get leads. In fact CB Super Affiliate Training is still very relevant until today. I would say the strategy taught inside is quite evergreen except some technical guide is already obsolete. 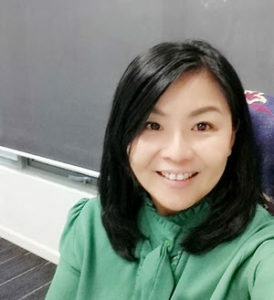 I buy this product because I need additional knowledge on paid traffic, funnel management and insider tricks to affiliate marketing including diverse ideas from another program. If budget allow, I strongly encourage anyone to take this up.